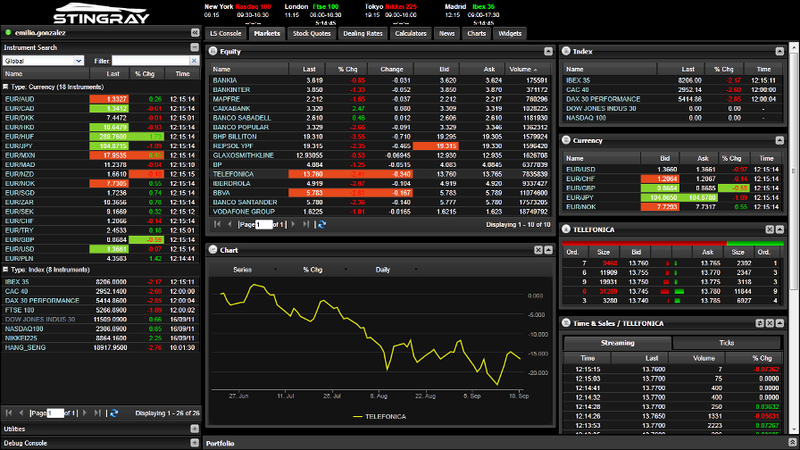 Stingray is a web space that manages native content, together with 3rd party widgets and the interaction between them. Leveraging the power of HTML5; for faster and more efficient write once, run everywhere apps. Stingray supports WebStreamer solutions and the integration of client libraries used to communicate with the leading push servers and WebSocket gateways that are part of WebFG's WebStreamer platform. It can leverage the advantages of HTML5/WebSockets which was designed for bidirectional, real-time communication over the Web. WebSockets provides a far more efficient protocol, and scales far more effectively than the existing http1.1 used currently with HTML4. Container = a web space which connects content. RIA = web applications with richer content that allow greater interaction. Development can be made within a single framework (a single container) with a unique architecture, hosting the content as widgets, web apps etc. Stingray has a local storage capacity for users (non personal) data and keeps this resident in the local device, avoiding the need to repeatedly download the same data each time the application is started. Has an off-line capability which allows the continued use of some features and content even when the internet connection is temporarily lost or in an area without coverage. Has the ability to integrate with the user's desktop. 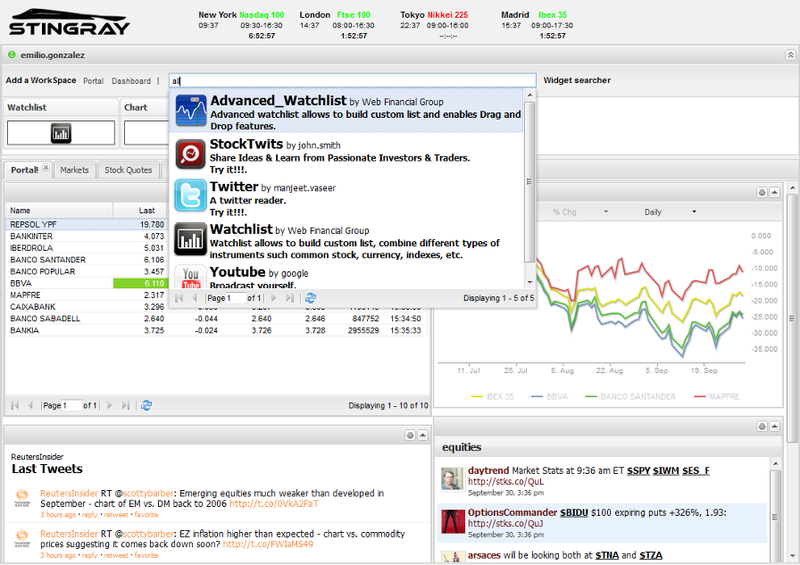 Easy to use 3rd party widgets off-the-shelf e.g stocktweets included with a "drag & drop". Users can play video upon their preferred device. Our objective was to develop an interaction between different components, whether developed internally or by 3rd parties. This interaction is via bidirectional widgets not only between themselves but also within the back-end. Stingray supports HTML5 and all compliant browsers, so that you write once and it will run on any browser; desktop, tablet, smartphone etc. The HTML function as an application. The use of multiple-threads. These "background threads" can do complex Mathematical Calculations, make Requests network, or local access storage while the main web page responds to the user scrolling, clicking, or typing. Stingray also provides scalability that allows you to maintain an effective way of distributing data, charts, news, etc that can scale to thousands of concurrent users.